There may be no more than a handful of sailboats in recent history that can be called milestones in that they significantly influenced the way in which boats were designed, built and sailed. Without a doubt, the Cal 40 is one design that fits this elite group. Introduced in 1963, the Cal 40 was so successful competing under the Cruising Club of America (CCA) handicap rule that there are some who blame the design for the demise of the CCA rule and rise in popularity of the European-influenced IOR rule. The IOR was not kind to the Cal 40, and production ended in 1972 after about 170 boats had been built. 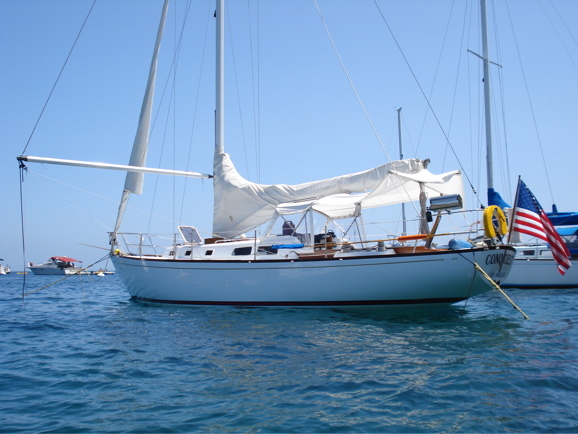 The Cal 40 was a collaboration of designer Bill Lapworth, California sailor George Griffith and Jack Jensen, owner of Cal-Jensen Marine of Costa Mesa, CA. Principal dimensions are 39’4" LOA, 30’4" LWL, 11’ beam, 5’7" draft and 15,000 displacement. Although Lapworth was not the first to conceive of them, many features of the Cal 40 design were a considerable departure from what was conventional wisdom of the time. Displacement was 25 percent below the norm, and the waterline length was 10 percent greater than similar sized boats of the day. Her fin keel, spade rudder, flat bottom, and hard bilges were radical departures from what was then considered safe and prudent for offshore yachts. Hull construction is of hand-laid fiberglass and resin which is strengthened by plywood bulkheads and fiberglass liners. To keep weight to a minimum, plywood bulkheads were minimally sized, and tabbing was rather lightweight. Tabbing failures and bulkheads that have been rotted by deck leaks are not uncommon. Because these attachments and structural components are so essential to the stiffness and strength of this light hull, it is critical that any problem be repaired and reinforced immediately. Many Cal 40s have been reinforced over the years with beefed-up tabbing, partial bulkheads, and added fiberglass reinforcement. The added weight is insignificant, and the boat’s strength has likely benefited from such addition. Rudder failures have also been a problem on many of these boats as they age, and, if not rebuilt or replaced yet, this is a repair that should be done before it’s too late and a rudder is lost. The hull to deck joint is bolted and then capped with a through-bolted teak toe rail to make a solid secure joint. If there are leaks at the joint, it’s a good idea to remove fasteners in the area and examine them for signs of crevice corrosion. Crevice corrosion is a condition that commonly affects stainless steel that has been trapped in a damp environment without sufficient ventilation. If small pinholes are visible when examined with a magnifying glass, the fastener must be replaced, because it is likely the internal damage is much worse than is apparent on the surface, similar to wood damaged by termites. The cockpit of the Cal 40 is large, and there is a large lazarette aft for storage. Most would expect wheel steering on a 40-foot cruiser/racer, and some Cal 40s have been retrofitted with wheels, but the original tiller is actually preferred by some skippers for its more sensitive feel. The boat is balanced well, and steering with a tiller is not difficult. The cabin trunk is low and allows excellent visibility forward with wide side decks and a large foredeck for handling headsails. If there is one criticism of the deck and cockpit, it is that the cockpit seating is not very comfortable. The teak combing is too low for good back support, not wide enough, and too far inboard to sit atop and lean back against the lifelines. Below deck I think it’s clear the design emphasis was on racing. Accommodations are comfortable but don’t compare to a modern 40-foot boat. The engine is in an engine box below the companionway with the galley to port and the navigation station to starboard. There are port and starboard quarter berths below the cockpit seats, but access is difficult, and they serve best for storage of sails and gear. Forward in the main saloon there are port and starboard settees/transom berths with outboard pilot berths. Going forward from the main saloon you step over an athwartships floor-like structure that is the foundation for the mast step as well as a welded aluminum frame to which the shroud chainplates are anchored. Forward, the head is to port, and a large hanging locker is to starboard with a V-berth cabin at the bow. This is not a fancy interior, but it works. The very earliest of the Cal 40s were powered by Atomic-4 gas engines, later by Gray Marine diesels, and last by Perkins diesel engines. Because even the newest Cal 40 is 30 years old, many have been repowered, and you’re quite likely to find a number of engines and drive combinations. The Cal 40 is underpowered with the Atomic-4, but otherwise any good engine that will produce an honest 30 shaft horsepower should be sufficient. The Cal 40 was one of the best performing sailboats of her time, and even today she is likely to embarrass some newer designs particularly in heavy air off the wind where she still shines. Because her bottom is quite flat, she can pound and be wet in adverse conditions. She doesn’t point as well as more modern fin keel designs with higher aspect rigs, but she balances very well and is easily sailed.